Calculating a temperature conversion can be one of the most confusing calculations in science or math class, but this spreadsheet helps you easily convert from Celsius to Fahrenheit and back again. Further, this spreadsheet is a teaching tool to teach you or your student the relationship between Celsius and Fahrenheit. 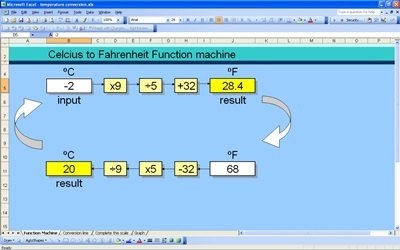 The first sheet on this spreadsheet is a brightly colored, friendly interface that allows you to insert a number for temperature in either Celsius or Fahrenheit degrees into either white box. Yellow boxes teach you which mathematical functions you need to perform this temperature conversion. For those needing a quick conversion, the spreadsheet instantly carries out the conversion for you. For those wanting to learn how to do the computations themselves, the step-by-step directions are an eye-catching teaching tool. If you need to do the calculation in reverse, the spreadsheet will carry out that function as well and once again, teach you step by step how to perform it. The Celsius scale is based around the freezing point of water (0°C or 32°F) and the boiling point of water (100°C or 212°F). This tool allows you to quickly convert between Celsius and Fahrenheit in increments of 10 on the Celsius scale. Insert a number in Celsius and it automatically displays 10 increments in both Celsius and Fahrenheit. A dozen scales like those given in “Conversion Line” with the same numbers missing on both sides of the scale. Great to print out and give to students to help them learn the temperature scale from 0°C to 100°C. The fourth and final sheet of the temperature conversion template allows you to graph Fahrenheit vs Celsius on any increment scale. It always forms a straight line, showing the direct correlation between the two scales.